You can create your own pencil textures by first creating an image file containing the texture, either in Harmony or in a third party software, then importing it to your pencil texture palette. A pencil texture must be created with transparency, as Harmony will only use the image's transparency channel to determine how to apply the texture to your pencil lines. Hence, pencil textures can be in image format that are supported by Harmony and which supports transparency: .png, .tga, .tif, .psd, .psb and .sgi. Click on the Add Texture button. Right-click on the swatch list and select New Texture. Open the Colour view menu and select Colours > New Texture. 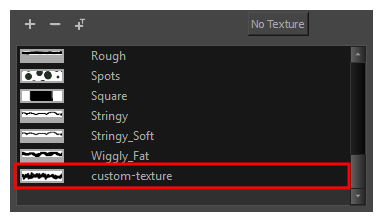 In the file browser dialog, navigate to the location of your texture image file and select it. The texture is added to your pencil texture palette. You can start drawing with your new pencil texture. 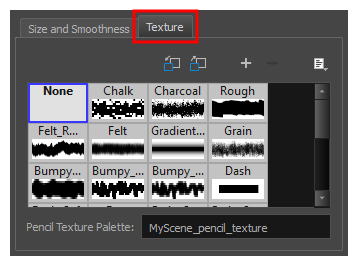 Click on the New Texture button over the pencil textures list. Open the Brush menu and select New Texture. 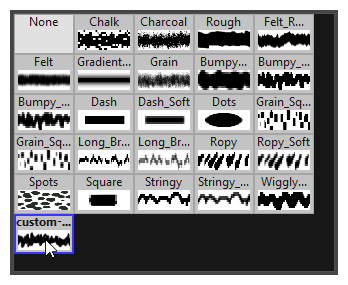 In the pencil texture library, select the new pencil texture.